It turned out to be a wrong VirtualBox Bridged Network setup. I give the Ubuntu guest a static IP of 192.168.1.4 (assigned to eth0). 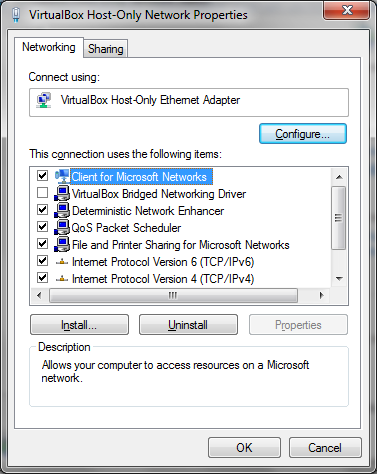 Then in the Windows 7 host, in the Network and Sharing Center, there is a new connection named "VirtualBox Host-Only Network" after the bridge is setup, that connection is again given the same static IP of 192.168.1.4. Once I change the "VirtualBox Host-Only Network" to automatically obtain an IP address, it's getting a different IP address of 169.254.249.70(Tentative). And now I can SSH into 192.168.1.4 with no problem, even without touching hosts.allow and hosts.deny. I've also noticed that in the properties windows (see screenshot below) of the "VirtualBox Host-Only Network", the second checkbox, "VirtualBox Bridged Networking Driver" is unchecked. While the same checkbox of the physical NIC (that is bridged to) is checked. So my further question is: is this how VBox bridged networking supposed to be setup? Any rationale behind this? I'd appreciate if someone could provide some explaination on VBox bridged networking setup on Windows host and I'll accept it as an answer. Even though I switched I needed to refresh my guest network adapter to pick up a new ip address, use the commmand ifconfig in the guest to find out what IP its using and set bbb-conf setip to that ip address result from ifconfig. The guest will use the host's adapter to get out to the web/network. Run Putty with the ip from above (ifconfig result) with port 22. How to get direct access to host network from Virtualbox running Ubuntu? How to access dev server in Ubuntu VirtualBox guest on Windows 7 host? How to run Virtualbox on bridged and host-only networks?